People believe all taxes are going up when they don't actually look at their tax bill. 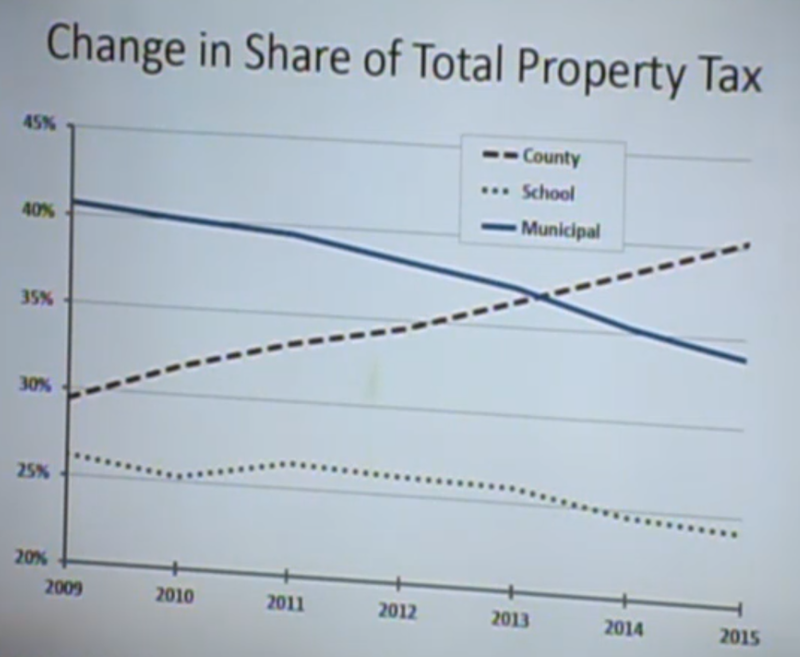 It's a refrain heard last night in the City Council when the Mayor's Administration delivered on its promise of fiscal restraint reducing an initial budge with less than a 1% increase to a flat 0. Unfortunately, Hoboken is being utterly destroyed by Hudson County inflicting double digit tax increases to Mile Square taxpayers. It's a divide which may be addressed when the County Freeholders hold a county meeting in Hoboken at City Hall on June 4th. The time of the meeting is set for 6:00 PM when of course most taxpayers will remain at work in order to pay the dramatic annual taxes inflicted on them by HudCo. 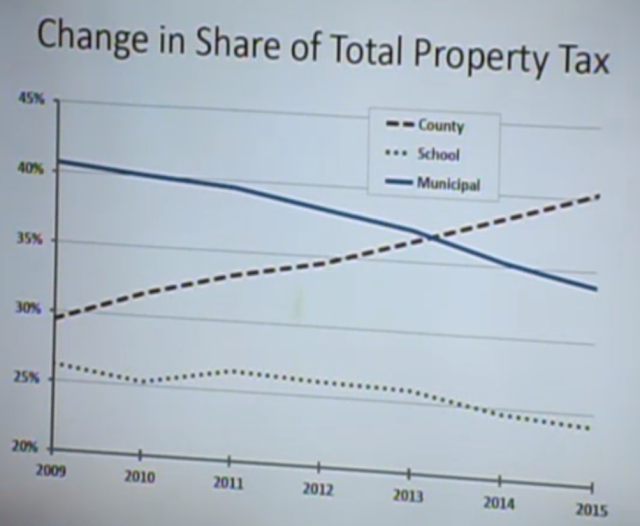 Last night a short presentation illustrated the historical tax slaughter wielded by Hudson County on Hoboken. WARNING: Please do not review these slides if you have a weak stomach. How taxes are impacted in 2015 by each segment. Which of the 'Big' three does not belong? 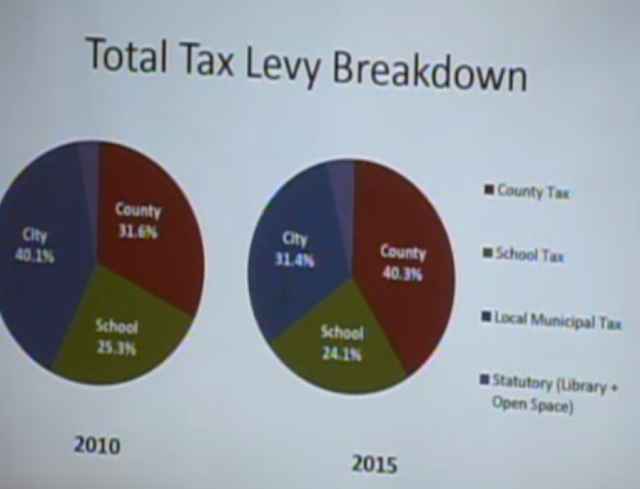 This chart presented by the Hoboken Finance Director shows the tax levy for the County (HudCo), BoE and the Municipal Tax (under the mayor) from 2010 to 2015 on a percentage basis. 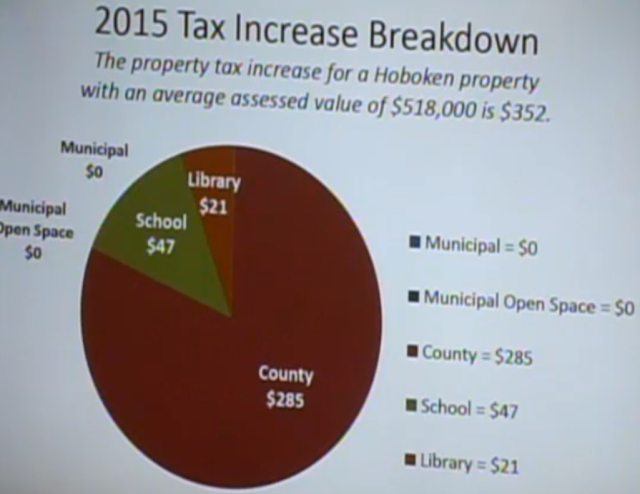 Last night, the Hoboken City Council passed a 0% tax increase with Mayor Zimmer by its largest margin under her stewardship 8-1. The sole no vote was Beth Mason who continues to complain about the existence of the good governance practice of maintaining a surplus. In the years of instituted budget hearings begun under Mayor Zimmer, she's delivered zero in budget saving ideas. Hoboken's credit rating has dramatically improved under Mayor Dawn Zimmer while a number of other New Jersey Cities are in the news just yesterday for their negative direction being downgraded. Talking Ed Note: Mayor Dawn Zimmer's Administration is getting it done for Hoboken with a Reform allied council. Many people deserve credit beginning with the mayor, Business Administrator Quentin Wiest, Finance Director Linda Dunn-Landolfi and reform council members. The working Reform majority are: City Council President Ravi Bhalla, council members Jen Giattino, Peter Cunningham, Dave Mello and Jim Doyle. In November, Peter Cunningham and Jen Giattino will be running for re-election.